Cyber Monday has become synonymous with exceptional retail bargains, however, there are essential business apps and software that are a must like Reputology. I have been given early access to a “must have” tool offered by HootSuite that can be a business’s best weapon of defense in today’s marketplace. HootSuite, the popular social media dashboard, offers an app called Reputology that allows you see everything customers are saying about your business in one location. It conveniently shows all the major review sites to save you time, and we all know time is money. We have all had negative reviews at some point, whether they are true or not, from a disgruntled ex-employee, a competitor, or just a customer who caught us on an off day. Negative reviews can be a business owner’s worst nightmare but they can impact your sales and even SEO. Studies at Harvard and UC Berkeley have shown that reviews can impact sales by as much as 9%. A recent study found that Google’s search algorithm weighs review volume and rating over other factors for SEO. In other words, your reviews play a huge role in how high your business ranks when someone does a Google search. Monitoring reviews allows a business the chance to respond quickly and even reverse a reviewer’s opinion. According to Jack Yu, co-founder of Reputology.com (the startup that built HootSuite’s new review monitoring app), their customers can get negative reviewers to change their mind approximately 70% of the time. The fact that this app really puts the reputation management into the hands of the business owner to turn around a bad review with efficiency is something that is a game changer for many of us. The Reputology app not only monitors reviews on all the major business directories, but it also tracks review sites that are industry specific to such hospitality, restaurants, retail, healthcare and medicine, auto dealers, weddings, and career and workplace. This app can allow a business to monitor activity for all of its locations at the same time from one platform. A company that has 350 locations would really have to search all of the review sites and look up each of their perspective sites, which would take a considerable amount of time searching individually. Sites such as Yelp, Google+ Local, Tripadvisor, Foursquare, Yellowpages, Yahoo Local, Citysearch, Urbanspoon, Opentable, Restaurant.com, Expedia, Hotels.com, Weddingchannel, Weddingwire, Vitals, Healthgrades, DealerRater, Edmunds, Cars.com, and MyDealerReport just to name a few. Why not have the feeds come straight to you and create efficiencies that allow you as a business owner to devote your time to other necessary projects? Reputology sends email alerts when there is a new review, across all of the business locations and it eliminates the worry of the business owner missing something. It also allows you to look back on your course of action and see what worked and what did not. There will always be the “negative reviews” as this is just a part of doing business and we can never please everyone. I would recommend this HootSuite app to any business owner who understands the necessity to monitor their reputation online. Below are a few links that can get you to the site. 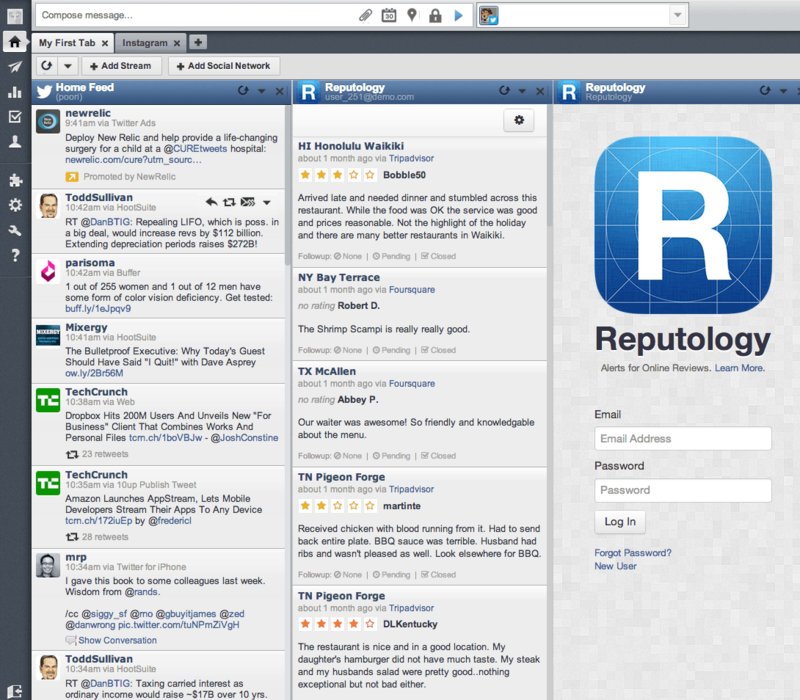 If you are already a HootSuite user you can use this link to find Reputology.